The engines on the 1190 ADVENTURE and 1190 ADVENTURE R have cooled down a little now. For our high-flier Hannes Arch, the trip with the KTM Team marked the end of his year and he’s signed off for his winter vacation after an awesome season. 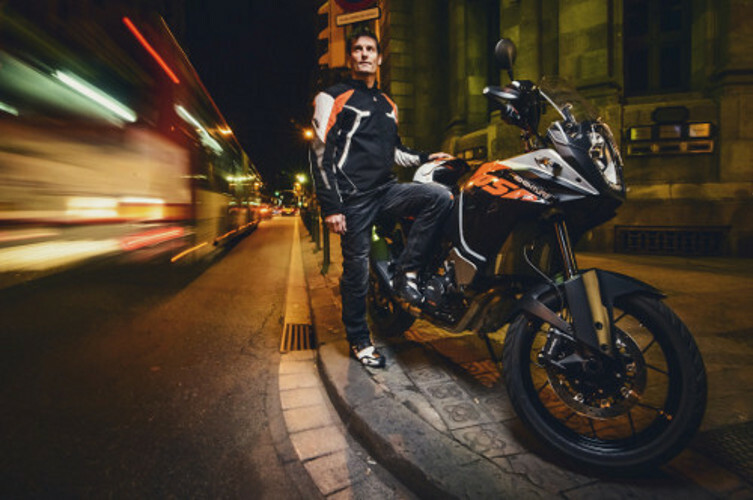 Marc Coma, on the other hand, is heading in precisely the opposite direction. Three weeks before the start of the Dakar Rally, the big Catalonian’s training and consolidation program is becoming massively more intense. Meanwhile in Mattighofen, the lines are burning in an attempt to complete the glorious ADVENTURE quartet. Two other grand masters have given a spontaneous thumbs-up to testing both the brand-new ADVENTURE models. In France, the former king of the slopes (as a multiple winner of the World Cup downhill on the “Streif” in Kitzbuhel, he’s a demigod in Austria and at least as popular as the federal president) and later Dakar winner, Luc Alphand, is packing his travel bag. 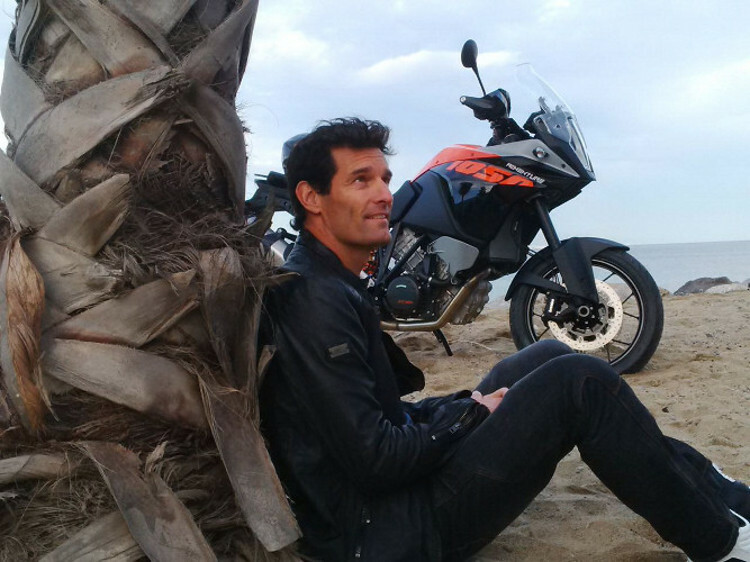 The passionate motorcyclist and KTM owner will complete a first test of the flagship 1290 SUPER ADVENTURE model, likewise in Barcelona, but true to the “super” motto with an extended ADVENTURE radius. DE: Luc Alphand bei der Qualitätskontrolle der Schweißnähte – très bien! | GB: Luc Alphand is checking the quality of the weldseams – très bien! Candidate number 4 and our star on the 1050 ADVENTURE is a real big shot in the speed business: Mark Webber! To be honest, I’d expected to receive a rejection when I typed the Australian’s number into my cell phone a few short weeks before our test. But instead of a “no sorry”, a friendly, enthusiastic “sure mate” rings out after a brief warm-up. In spite of a jam-packed diary – Mark Webber is currently an official factory driver in the Porsche LMP1 Team – the smart professional racer would like to devote one day of his career to the new 1050. DE: Mark Webber, Palme, Strand, ADVENTURE – schön! | GB: Mark Webber, palm, beach, ADVENTURE – beautiful! No sooner said than done! What was conceived as an off-the-cuff idea in typical KTM style in the Mattighofen head office, is actually taking place. 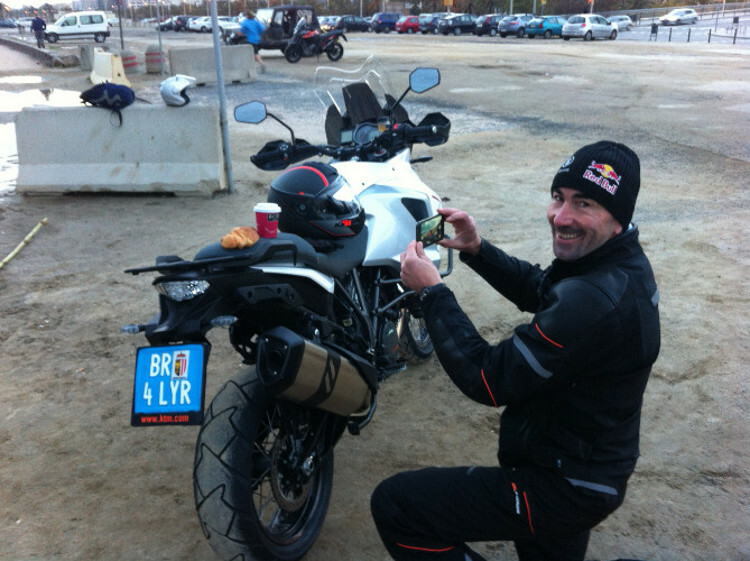 Luc Alphand and Mark Webber have landed, checked in, and turned up with clean visors ready to ride the new ADVENTUREs. How cool is that? 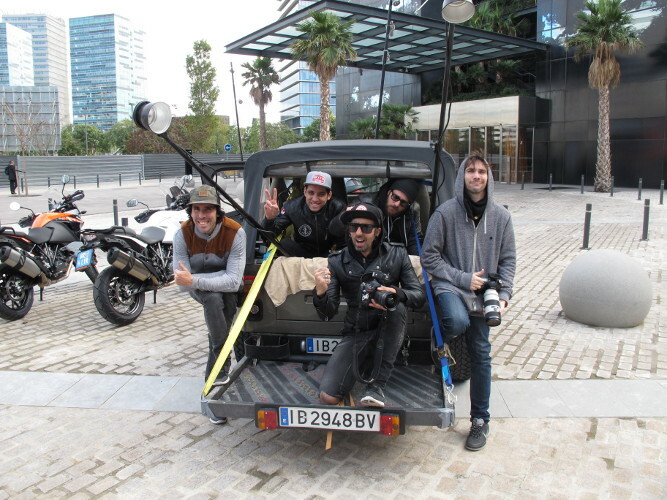 Sebas Romero’s highly motivated Black & Rad crew are on their marks to take the customary photographic documentation of the fourfold adventure. 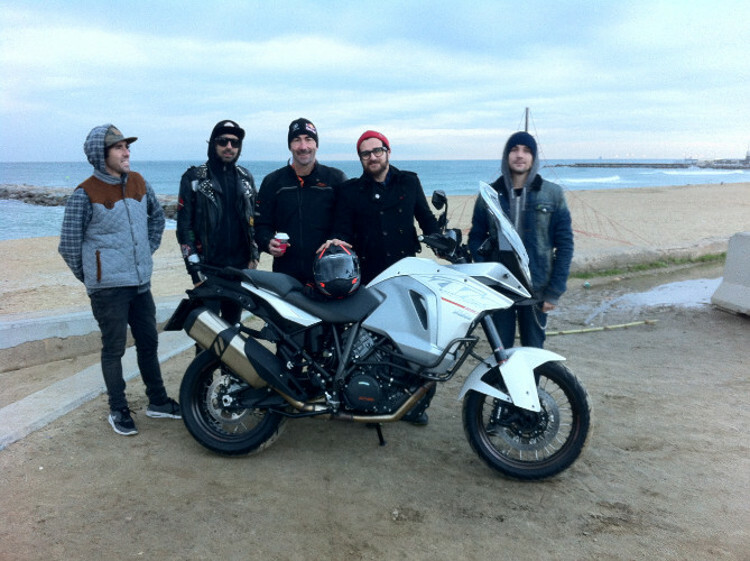 So we head out again into the Spanish metropolis, start the ADVENTURE engines and unleash the champions. Luc Alphand, who despite his 49 years can still get as excited as a first-grader, takes the big outside lane on the luxurious ADVENTURE. Mark WEbber, incredibly fit and despite visible remaining wounds, swings himself onto the 1050’s saddle. While most people in this condition would be whimpering sleepily on a sofa, the 38-year-old fires up the twin-cylinder. ADVENTURE rocks! All the experiences of the four ADVENTURE heroes will be recounted at the beginning of 2015 in the “UNBOUND” magazine published in German, English, French, Spanish and Italian. Many thanks to Marc Coma, Mark Webber, Hannes Arch, and Luc Alphand for their tremendous dedication and to the whole team for organizing such an unforgettable event. One Response to Fourfold Adventure – Part 2! GREAT cycles for NOTABLE riders = KTM! Appreciate Mattighofen’s ‘Adventure’ Series with many available Powerparts better to ‘tailor’ these cycles to rider preferences. Congratulations on 100,000 (thus far) ‘Made in Austria’ cycles birthed in 2014! EXPECT a greater number in 2015 once our GLOBAL cycling PUBLIC learns of your ‘brand’. Product request – a well conceived, implemented and priced ALL purpose ‘traction enhanced’ 750cc V-Twin.